Saturday I went to an advanced, (Oh, aren’t you so pleased to no longer be considered a beginner) bee keeping class. It’s main goal, from my standpoint, was to re-energize and re-stabilize me, giving me the confidence to face either certain failure or the huge opportunity to move ahead because I did a good job thus far. My inspection lead me to think the second option is where I’m at. Wooo Hooo! I managed to keep my hive alive for a year. OK, calm down here. The workshop was two and a half hours of intense; jump right into the NUC boxes (miniature hives for making new hives) and dig around in the bees. It gave me the confidence and enough knowledge (I thought) to go home and tackle my own hive’s first inspection of the year. The top “super” was all honey when I put the bees to bed last fall. It is smaller than the other two boxes which were chock-o-block with bees. Over the winter I saw an alarming number of dead bees outside the hive. There was a veritable carpet of bodies before the last snow fall. Today certainly there was no shortage of bees. I cracked open the “honey box” and was pleased to see at least five of the ten frames were still heavy with the golden food. I quickly set these aside, though one small white larva caught my eye in the center on the very bottom. When I pulled the medium box off I was horrified. 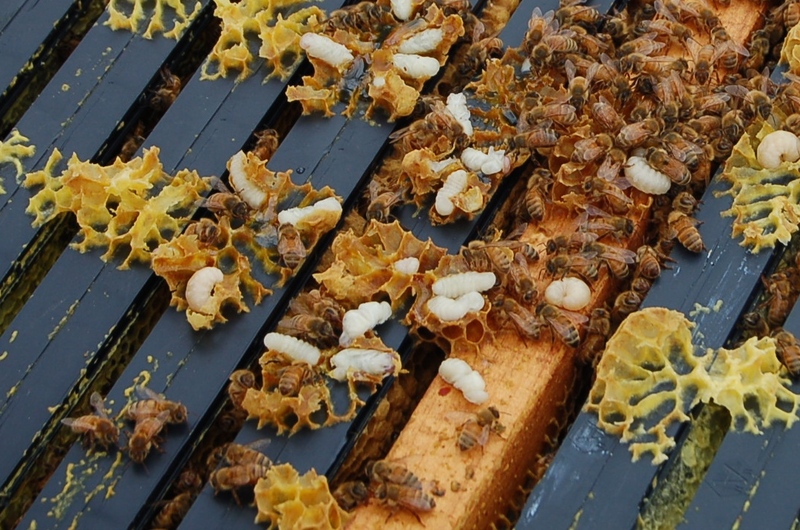 These are bee larva large enough to be viable bees, fully formed and days from hatching. But they were hatched, exposed and not moving. 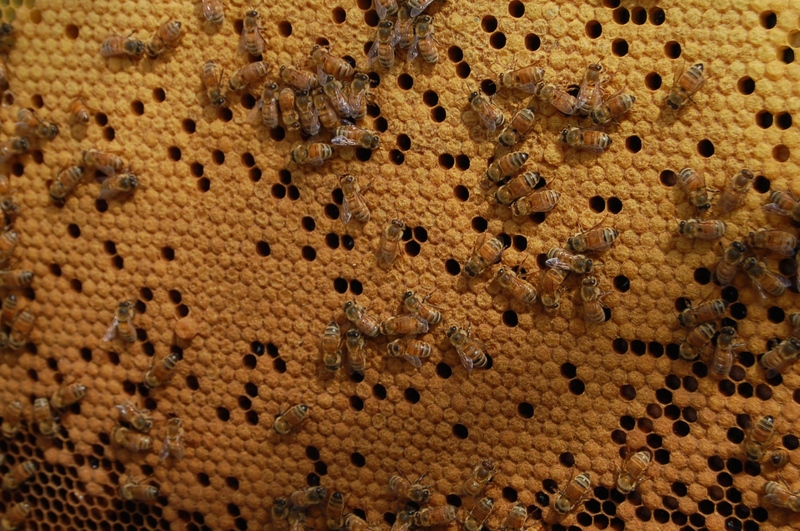 Zooming in shows how large they are, relative to the worker bees. I’m thinking they are drones and were not needed this early in the season, still, it was a horrible sight. I dug into the second hive body. Beautiful capped brood, even some honey on the edges. As you can see, these hive boxes are about 55 pounds and need to be moved carefully and gently. It’s a great core work-out! After going through the bottom hive body, I switched the two large boxes with the intention of getting the queen and her court to head up into the empty frames above. There was one other troubling item; some of the frames full of honey in the medium box seemed to have cells with green mould in them. I couldn’t imagine the honey itself had moulded. A quick call to Hanni, my daughter and fellow bee-keeper in California, confirmed it was probably last year’s pollen that had moulded since I didn’t see whole sections of it and wasn’t a concern. I returned the medium body to the top and closed it up as the “lady’s” were getting irritated with my poking around in their lives. 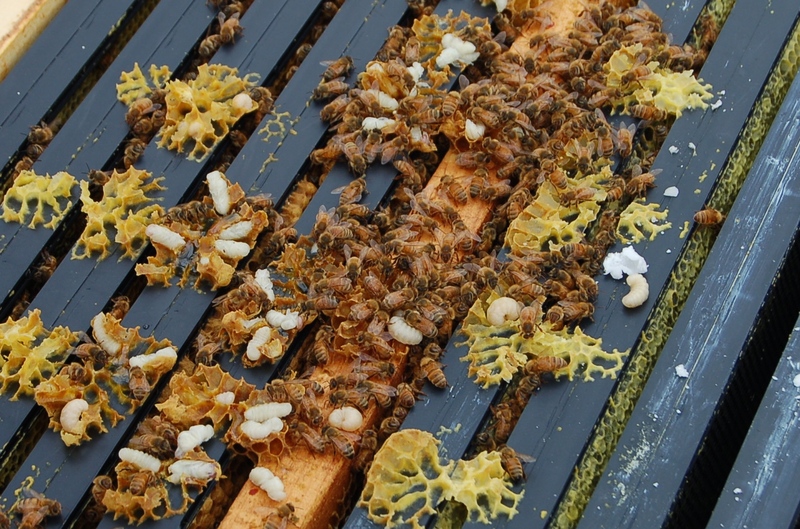 It wasn’t until I reviewed the photos that I saw, my missing queen must have been in the top, honey laden frames, as there was new brood there as well. 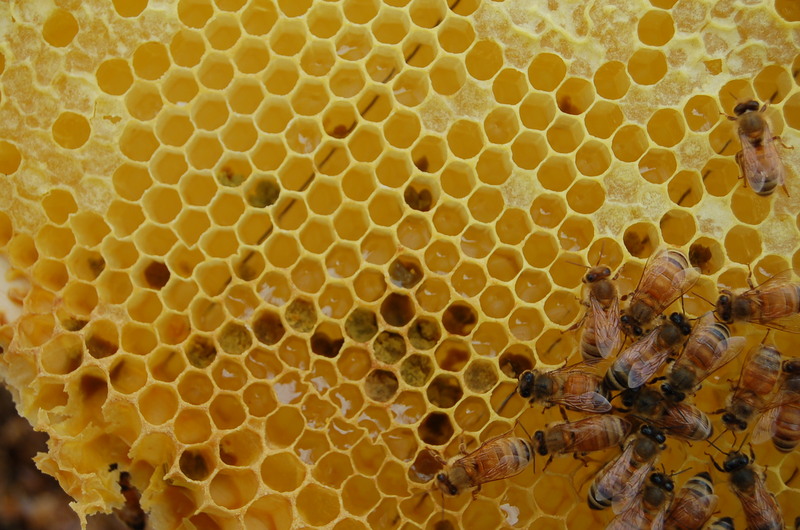 From the lower bee on the right, count over five or six rows and you will see the tiny “grain of sand” eggs. I showed my photos to Korey, fellow bee-keeper and my boss, who said he had seen the same issue with the fully formed larva last year. He panicked, shipped photos off to Jodi, who calmed him with the observation that those cells had been attached to the bottom of the frames, stuck to the box below, and when I pulled the box off, I broke the cells releasing the larva. This is not a huge issue as there obviously is tons of reproduction going on. So, the larva are lost to me as bees but everything else seems to have going along nicely. I suspect they are getting a little crowded and I need to add frames or split the hive very soon. This entry was posted in bee keeping, beekeeping, bees. Tagged bee hives, bee keeping, beekeeping, Bees, New Hampshire. Congrats on a full year of bee keeping! Sounds like overall it is going great. Happy bees so happy me! Thanks for stopping by and following me!! I am extremely jealous of the brood patterns on your frames! Guess I better start thinking about a split, no? It looks like you also have bears. Have you ever seen this blog called New Hampsha Bees?http://nhbees.wordpress.com/ It’s all Greek to me but you might benefit from his knowledge. First, thank you for the connection to New Hampsha Bees. This is invaluable! It is not greek to you! You who see the patterns and textures and colors, (despite colorblindness) of every minute form of nature, you see as well the connection here!! 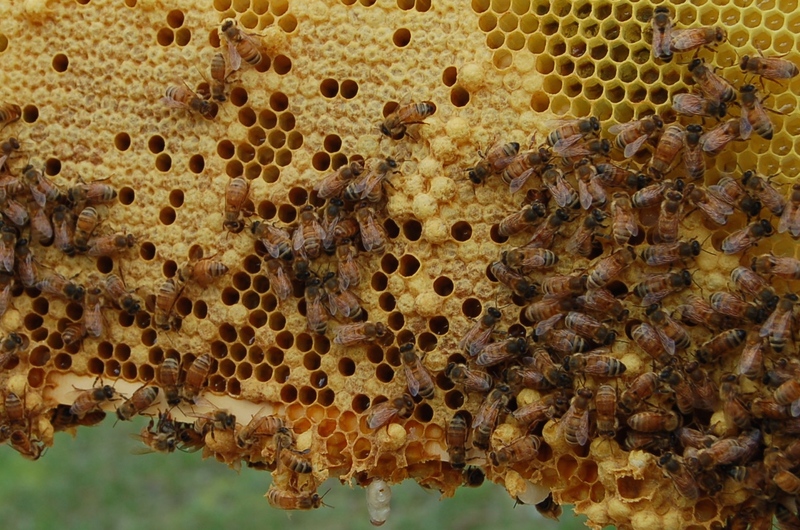 Keeping bees sounds like a very interesting thing to do. 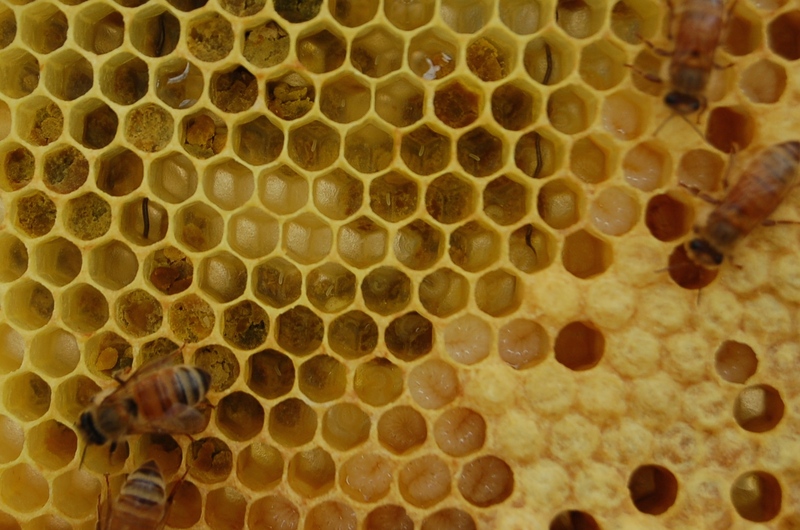 Have you sampled your own honey yet? I have! Right out of the hive, still warm. It is wonderful! I have to say this is a fascinating hobby and the people I have met are all such kind, calm folks.